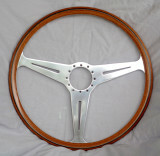 Seagull thin slot - 16.5"
Hello. 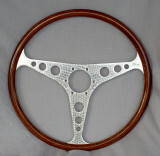 I am interested in purchasing a wheel from you for my Sprite. I look forward to hearing from you. Thanks. 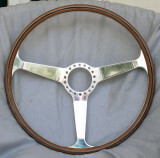 I am interested in purchasing a wheel for my 1960 Bugeye (Falcon LeMans type). Please forward contact info/ordering instructions. Cheers! 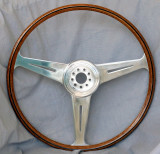 Finally picked up my new Derrington-style wheel at my folks. 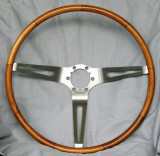 It's gorgeous! And worth the wait. Thanks, Mike. 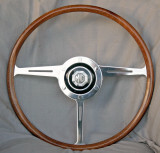 I was directed to by cgwood, I'm redoing the dashboard in a 73 Triumph TR6, and would like to have all matching wood,(dashboard, shift knob and steering wheel). 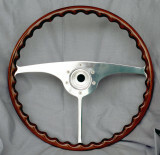 How much of a deposit do you require for a wheel? 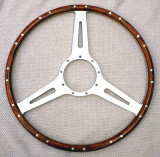 Mike, a few months ago, I think I asked if you were considering producing the centre horn push piece for Les Leston steering wheels. 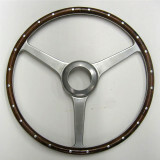 There must be hundreds of wheels on the market without the metal centre piece (including three of mine!) Has any progress been made to date? 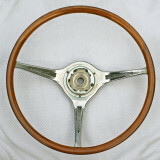 I am looking for an original or original looking steering wheel for my `62 Lotus Super Seven. 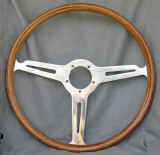 According to my research it should be a three sloted spoked woodrim steering wheel, about 14 inches across. Do you have anything available? 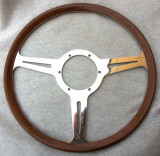 I'm looking for a new wheel for my '69 MGB. 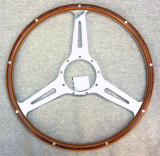 I like the traditional three spoke drilled with wood rim. First, what is the cost, and second, do you supply the hubs as well or do I need to get that from Moss or someone else? Thank you! 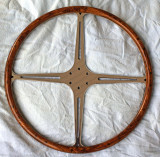 Your wheels are beautiful! Saw your posting on Harrington Web Site. 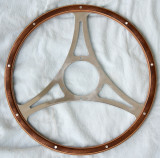 I have an original Le Mans wheel wheel that could do with a rebuild. Please mail me with a cost. Ta! 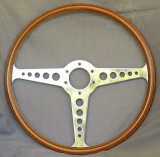 Please, could I know price (with carriage cost for Italy) for a Le Mans steering wheel for my sprite frogeye MK1. I need also box. 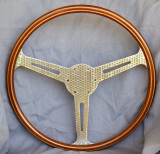 Does anyone know where i can get one of these wheels? 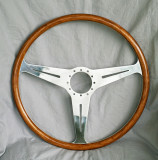 Derrington 14" Black Walnut plus trim ring and hardware. 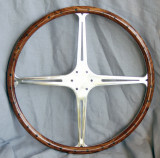 What is the price for this wheel? 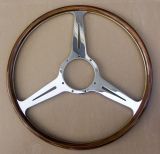 Nice original perspective... Take a look at my automobilia gallery.